Knife Rights is a small organization that is producing big results. The founder, Doug Ritter, has said that they have created a “second front” in the war to restore the Second Amendment. He is correct. In 2010, Doug convinced the NRA lobbyist in Arizona, Todd Rathner, to join the organization. The small but effective organization has produced astounding results, rolling back abusive, antiquated knife laws in 15 states. They have accomplished complete knife law reform in Alaska, Arizona, Oklahoma, Kansas, Wisconsin, Tennessee, and New Hampshire. Adults in those states can now carry and use knives for legal purposes without fear of breaking the law. They have been able to pass knife law preemption in Utah, Texas and Georgia. This prevents a crazy quilt of knife laws that are easily broken simply by crossing the street from one local jurisdiction to another. They have been able to repeal knife bans in Washington State, Nevada, Missouri, Indiana, and Maine. They have been involved in successful litigation to preserve rights in California. In 2017, they have already put several states into play for knife law reform, and have been able to have federal knife law reform introduced into the House of Representatives. On January 3rd, 2017, the Knife Owners Protection Act (KOPA) was introduced in the House of Representatives. This act also repeals the silly ban on the interstate trade of switchblades. The irrational law was passed in 1958, based on false assertions about the relationship of switchblades to gangs. The switchblade law was a precursor to the anti-Second Amendment Gun laws of the 1960’s. On January 24th, in Virginia, House Bill 1432 was passed out of committee to go to the full House for a vote. The bill removes the prohibition on the carrying of switchblades, as long as they are carried for a “lawful profession” or “recreational activity”. On January 24th, in Colorado, SB 17-008 passed out of committee and heads to the Senate for a vote. 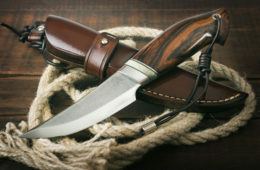 The bill removes “gravity knife” and “switchblade knife” from the category of prohibited weapons. On January 25th, in Georgia, SB 49 was introduced to reform the knife law. Currently, knives with blades longer than 5.5 inches are prohibited from being carried. The bill increases the acceptable blade length to 12 inches. Knife Rights pushed for the state knife law preemption bill that was passed in 2012. On January 25th, in Illinois, SB 607 was introduced. A similar bill came very close to passage last year. The bill would allow people with a Firearm Owner Identification Card (FOID), or people in the business of selling knives, to carry switchblade knives. In Illinois, residents must have an FOID to be able to legally own or purchase firearms. The year has barely begun. No one knows how many of these legislative initiatives will be successful. Given Knife Rights record, passage of more than one reform is likely. Knives are clearly “arms” as protected by the Second Amendment. As courts have upheld Second Amendment rights, antiquated knife bans and carry restrictions have become obvious and irrational artifacts of another age. The “Second Front” in restoring the Second Amendment cuts into the soft underbelly of the the organizations opposed to an armed citizenry. Copyright © 2019. Bullets First. All rights reserved.